Los Angeles is of course best known for being home to arguably the most glamorous industry in America–moving pictures. But another, decidedly less glamorous, business has been bustling in the Southland and some experts believe this quickened pace of transactions is solid evidence that the economic climate is improving. We’re talking about the cargo industry. 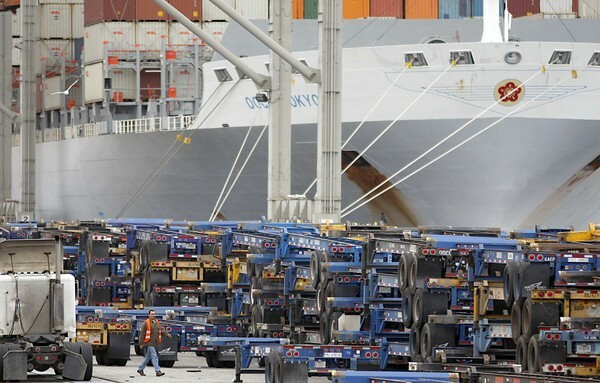 In January, traffic at the nation’s most robust ports, in L.A. and Long Beach, ticked up 1.6%, meaning over 1 million containers were handled this year versus just over 986,000 a year ago. While the improvement is modest, it takes on greater significance when you consider that for all of 2009, activity at the two ports was down 17.4% from the previous year. The improvements were driven by exports, which accumulated a 31.8% rise over 2009. Imports, meanwhile, were down slightly from the prior January. Three sectors have led the way–travel, royalties and license fees and financial services. Those areas accounted for more than $260 billion in 2008 alone. So if you are looking to start a new service company you might consider licensing travel ideas to banks. Could be bigger than plastics.